Captain Tommy will show you how to catch fish in the Apalachicola Bay and River! Target species include Tripletail, Redfish, Black Drum, Pompano and more! Captain Tommy Holland loves showing children the fun and excitement of fishing! Captain Tommy Holland Guide Service will hook you up! 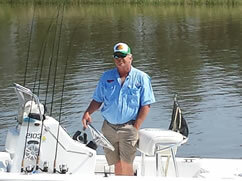 Captain Tommy Holland has been guide fishing in Apalachicola & St. George Island, Florida for over 20 years. Ready for an exciting day on the Apalachicola Bay or River? While visiting the Forgotten Coast of Florida Captain Tommy will show you how to catch fish in the Apalachicola Bay and River. Targeted fish species include Redfish, Speckled Trout, Tripletail, Flounder, Pompano, Black Drum and Tarpon. Captain Tommy guarantees you will catch a lot of fish and have a great time! The Apalachicola River Basin and Apalachicola Bay comprise the most ecologically diverse natural area in the southern United States. On an eco-tour with Captain Tommy Holland you will see several species of plants and animals many of which are rare, threatened or endangered and many of which are found only in this unique area. Call (850) 653-5321 to book your eco-tour today. A shelling trip with Captain Tommy Holland is a wonderful way to explore and enjoy a remnant of Florida’s original natural landscape. Call (850) 653-5321 to book your shelling trip today. Captain Tommy Holland is an Apalachicola native, born and raised on the Apalachicola Bay. He has extensive knowledge of the local landscape, which guarantees you will catch a lot of quality fish and his energetic personality ensures you will have a great time! He is US Coast Guard Licensed, Approved and Insured.